Outside of the once semi-regular Wild Turkey 101 12-year release, what was the first bona-fide super-premium Wild Turkey expression? You got it – Rare Breed. Introduced in 1991, Wild Turkey Rare Breed was undoubtedly Master Distiller Jimmy Russell’s response to Jim Beam’s introduction of Booker’s in 1988. Not to be undone, Jimmy Russell took barrel-proof blending a step further by adding 12-year whiskey to his signature 6, 8, and 12-year straight bourbon blend. Booker’s, on the other hand, was (and remains) a label-proclaimed 6-8 year batch. While both whiskeys continue to be enthusiast favorites, Rare Breed is arguably more approachable to the average consumer based on today’s proof and price. Initially, Rare Breed was released as an entirely new batch annually (sometimes semi-annually), along with the occasional export-only variant (well, re-label), “From the Makers of Wild Turkey,” 1855 Reserve. In fact, many of you reading might find the following chart helpful. It’s a comprehensive (well, work in progress) list of all known Rare Breed batches from 1991 to the present (in image and PDF formats). Special thanks to the Tokyo Bourbon Bible, the Straight Bourbon archives, and a few kind individuals (many from Reddit’s r/Bourbon), for their wealth of invaluable information. This chart wouldn’t have been possible (or at least near as easy to compile) without those sources. As you can see from the chart, by the time batch RB 01-99 comes around, Rare Breed releases begin to repeat year over year. Not that it’s always a bad thing (batch 01-99 is actually a personal favorite), but it’s arguably a somewhat lazy thing if one is being completely honest. I mean, take a look at batch 03RB. It spanned nine long years. By comparison, Booker’s saw multiple batches annually – a trend that continues to this day. So here we are entering our third year of Rare Breed batch 116.8. I’ll have to say, I’m a stalwart fan of this release. Having sipped numerous bottles of this particular batch – from the transitional label style up to the current bottle redesign – Rare Breed 116.8 remains a regular pour in the Rare Bird household. When I first heard that 2018’s Rare Breed might contain more well-aged barrels (confirmed by Bruce Russell on r/Bourbon), I was most certainly interested. 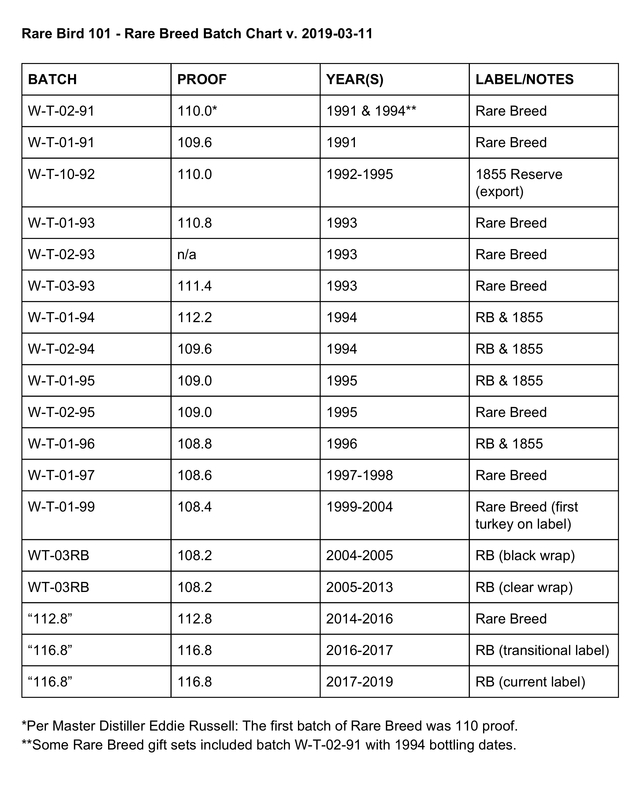 Would recent batches of Rare Breed 116.8 have the same level of differences I noticed between 2017 and 2018 Wild Turkey 101? Maybe even more so? Well, there’s only one way to find out and that involves – you guessed it – sipping whiskey! But before diving in I should mention that I previously tasted a generous sample of a July 2018 Rare Breed bottle and enjoyed it thoroughly (thank you, Aaron). To make certain this review was completely accurate, however, I waited on a full bottle (LL/GH code prefix). I’m so glad I did. My results may (or may not) surprise you. Let’s pour! Overall: It would be remiss of me to call 2018’s Rare Breed 116.8 an average pour. It’s far from that; however, it’s nowhere near as impressive as I assumed it would be in comparison to my recent experience with Wild Turkey 101. 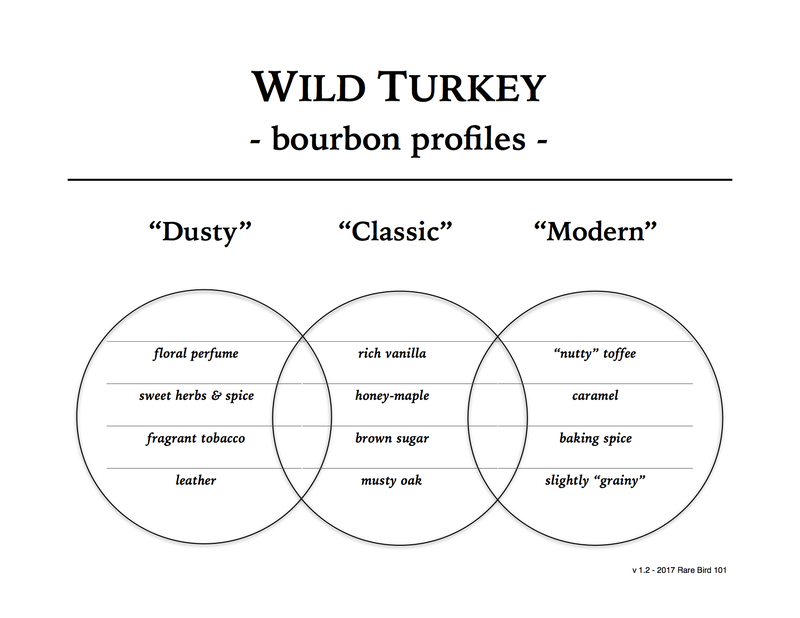 In other words, where I’d previously noticed distinct differences between 2017 and mid/late-2018 Wild Turkey 101 … well, I’m simply not getting the same level of distinction between 2017 and 2018 Rare Breed. There are differences, though in the grand scheme of things (and considering no dilution), they’re relatively minor in terms of profile and overall satisfaction. Is 2018’s Rare Breed better? Yes. Extraordinarily so? No. I suppose many folks will disagree with me and say there’s greater differences. That’s completely fine. Their opinions are no less valid than mine. At the same time, I hope it’s more than conjecture guiding their thoughts. In order to make sure I wasn’t relying on memory alone, I compared mid-2017 (LL/FH) and mid-2018 (LL/GH) both blind and revealed. Each time the outcome was the same – both pours are of similar quality with minor differences in profile (notes and mouthfeel). If I were to generalize my opinion, I’d say that 2017’s Rare Breed shows a little more vibrancy and spice, while 2018’s Rare Breed is a touch more rounded and sweet. And that’s about it. At the end of the day Rare Breed is what it has been for many years now – a barrel-proof bourbon batch that errs on the younger side of its parts. Or more appropriately, it tastes more 6-8 year than 8-12 year. If you think I’m incorrect, I’d highly suggest having a pour of Rare Breed batch 01-99 (or prior) to establish a wider perspective. As for the expression itself, I’d love to see a true return to form. Yes, Rare Breed batch 116.8 is notably better than batch 112.8 – equivalent to latter batches of 03RB in quality as well. Yet Rare Breed could still be much better. How’s that you ask? Easy – take a look at W. B. Saffell. Why can’t we have that as an annual Rare Breed batch? I think I’ve said enough right there. Being fairly knew to Bourbon (Whisky in general also) I’ve only had the 112.8 and the 116.8 – enjoy them both, though the 116.8 more. I’d love to see it more 8-12 years. I read somewhere (maybe here) that those are Jimmy Russels favorite ages for Bourbon. I think I read also that 6-12 were Booker Noe’s favorite ages. It would be great to bring Rare Breed to Jimmy’s favorite ages. Great article! Oops – I meant 6-8 for Booker Noe. Hence Booker’s age. Thanks as always, Jon! While there’s no way to know the exact percentages of ages in Rare Breed, I’m either tasting more 6-8 – or – 8-12 from lower floors (hard to say). But yes, I’d love more 10-12 – particularly from mid to upper floors. Great write up and well made points, but I disagree with you on this one. The LL/GH or GI etc have been a step up in my opinion. May I suggest trying a few later vintages i.e. GI and later? I haven’t had any RRSiB GH, but have a F bottle RRSiB that I compared the RB GI to and I like the RB better. So, for $35 out the door, RB is becoming my go to WT pour. Don’t spend that. Got it from Campari today – nationwide release. You’re wise not to fall for price gouging! I disagree, the LL/GI was great; spicy and sweet, with a fantastic mouth feel. I went back and purchased 2 more bottles, 4/5 to 4.25/5 in my humble opinion, especially after 3+ weeks and that baby starts to oxidize. Cheers! I respect your opinion and thanks for sharing! Also, do you know if the Saffell is being released in Chicago-land? or Illinois for that matter? It should be. That’s a large market. I’ve been trying to get details but no luck yet. Man, was this written by an accountant? That’s a load of numbers, brother! Nice work. I also am a huge Rare Breed fan and can still get it at one store for … wait for it … $38. I should clean the shelf off but there’s no shelf space on which to stuff it at home. Good, thorough review. Sipping a Rare Breed bottled “GI” (it’s been open for a few weeks plus). Sweet maple oak hey-sus! This is probably the sweetest barrel proof bourbon I’ve tasted. Very well rounded. I’ll be looking for more at this price point. Love that 2018 Rare Breed!